InCrowd has again expanded its crowd of international healthcare professionals and is now conducting micro surveys in over 14 countries. Conducting native language surveys in the EU Big 5 is now as simple as a mouse click. InCrowd on demand micro survey platform. InCrowd’s international expansion is changing the speed of international research, a process that took weeks or even months can now be completed in days or even hours. InCrowd, the only provider of real time market intelligence for the pharmaceutical industry, announced today the continued expansion of its international Crowd of healthcare professionals. Effective immediately, companies can gain real time data from healthcare professionals in England, France, Germany, Italy, Spain, the Netherlands, Belgium, Austria, Switzerland, Sweden, Mexico and Brazil in addition to accessing healthcare professionals from across the United States and Canada. Along with the addition of healthcare professionals in 14 new countries, InCrowd has also added native language surveys in French, German, Spanish, and Italian. The ability to quickly and easily conduct surveys in the respondent’s native language provides pharma access to market data that previously took weeks to collect. Over the coming months, InCrowd will continue to add international healthcare professionals to its Crowd of respondents. The next countries to be added include Denmark, Norway, Poland, Czech Republic, Argentina, Slovenia, Croatia, Turkey, Australia and Portugal. Continuing with expansion efforts, InCrowd recently added pharmacists, dentists and veterinarians to its overall Crowd of healthcare professionals. Retail pharmacists from this newly created Crowd participated in seasonal flu market research; the full report can be accessed here. InCrowd’s on-demand platform provides direct and immediate access to Crowds of screened and targeted healthcare professionals. Crowd queries are fast, easy and specialized for the healthcare industry. Micro surveys facilitate fast response rates, while specialized crowdsourcing provides answers within hours, even minutes. 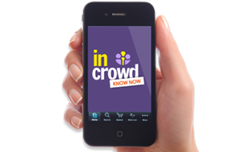 InCrowd Answers features an easy to use, DIY dashboard providing total control and access to real time data on a 24/7 basis; while InCrowd Answers Plus offers a full service research suite for getting answers in real time. InCrowd is the only company offering healthcare focused real time market research. For more information, visit InCrowd, Inc.